Liked it a lot! I will buy it again and I think it's quite gently for being an acne treatment. My skin is a bit dry and it did not make it more dry! I really wanted to love this product and when I spoke to a customer service representative it was recommended to me, and yet it has been the worst thing I have ever put on my face. I'm not exaggerating. The first two times I used it, it was fine, but one night I used it and my face became extremely irritated, there was a burning sensation and it itched like crazy. I immediately had to wash it off because I was in so much pain! This was very strange to me as I don't have sensitive skin at at all. What's worse is that the morning afterwards my skin was super dry and scaly, which again is strange for me as I don't have dry or sensitive skin. Instead of making my skin better, it's actually made it worse. I'm very disappointed because I had seen good reviews about this product and as I said earlier, I was told by a representative that this cream could help with hyperpigmentation. Please avoid this product like the plague! I am a 35+ French one struggling with hormonal/bacterial acne, with a quite light skin. I have no deep scarring but my skin has never been really clear. I am coming from abysses with 3 cures of medication and tons of various topic treatments tested around, via mainstream or selective cosmetics and through dermatologist prescriptions (oral and topic). This product along with other PC products did improve the texture of my skin . I've just opened my 3rd tube and am always freaking out of running out of it. The texture is not drying at all, this gel cream leaves my skin smooth and non greasy. Red marks fade more quickly and it prevents my skin from extra breaking down. A little bonus, it has anti aging effect too. Customer Care: Thank you for your review, If you want to stay informed about our promotions please sign up for our newsletter. The shipping costs are actual costs from the Netherlands to various destinations, we are always monitoring this! I had quite high hopes for this product but ultimately I didn't really notice a difference. My skin did have a slight negative reaction at first - so I suppose it was doing at least something (haha) - but that went away after a few weeks and my skin is very reactive to begin with. When it comes to effectiveness, this might just have been a poor fit for my skin. There are additional downsides, however, that made using this product unpleasant for me. Firstly, it smells. I know there is no fragrance in this, but something about the ingredients does it. The product also started to separate before I had finished the tube. I suspect this might be because of the packaging, which I noticed had cracked on one side of the tube. Tube packaging probably doesn't need to be very sturdy to withstand gentle squeezing so I was surprised that it didn't and pretty disappointed with the quality. I've been using this product everyday for the past 3 months and have seen a gradual but natural fading of my post acne marks and shrinking of the large pores on my cheeks. What's more is that it significantly reduces my redness and irritation overnight. I was sadly using a BB cream for to months (prior to this product) that contained a high percentage of alcohol, which dehydrated my oily skin and deepened a little indent next to my chin leftover from a cortisone injection years ago. Well Clear Skin Daily has reached "amazing" status in my book because over the past 2 weeks in particular, the indent has lessened and is becoming smoother! OMG I love this formula! Thank you so much Paula's Choice for all your guidance, wealth of information and products I can trust in. hynoki - effective combination acne control! Visibly effective at fading (and preventing?) acne spots, and the texture is pleasant enough for night time, though a bit too thick for daytime in the summer. 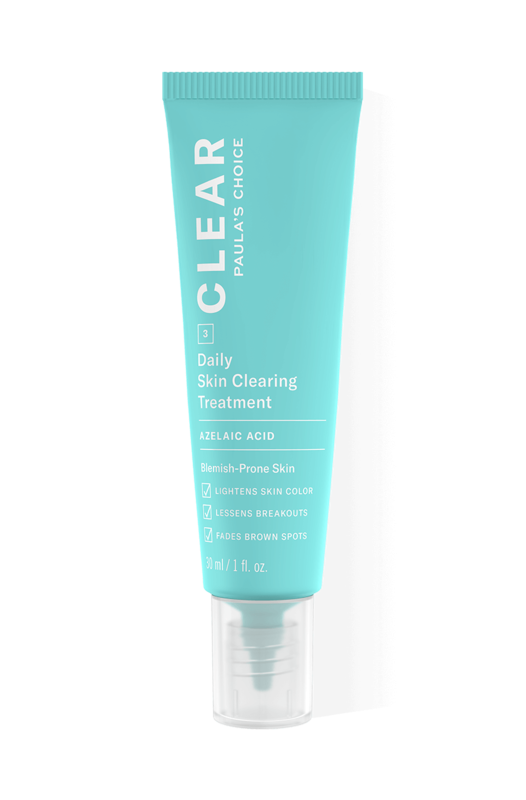 Though Clinique's BP acne treatment also works like a charm, I prefer this one as it combines a few different approaches to acne control in one product (less fuss and fewer tubes make me happy!) , also it doesn't bleach my nightwear and bedsheets like BP does. I don't see it really fading my sun damage spots though.